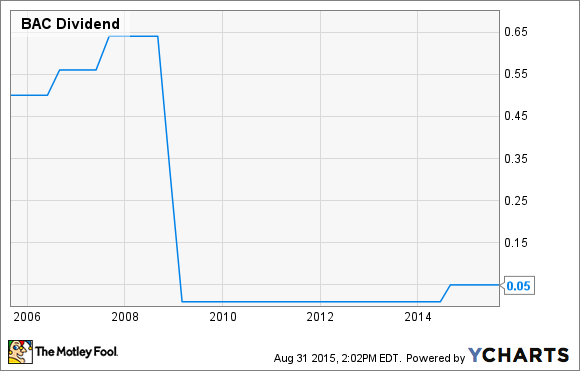 When Will Bank of America Raise Its Dividend Next? Shareholders will have to wait until March 2016 before Bank of America announces its next dividend increase. Investors in Bank of America (NYSE:BAC) have waited patiently over the last few years as the nation's second-biggest bank by assets has slowly started to ratchet up the size of its quarterly dividend payment. But at $0.05 per share per quarter, it's still one of the lowest payouts in the industry. Given this, current and prospective investors alike would be excused for wondering when Bank of America will increase its dividend next. When it comes to dividends, it's important to recognize that banks are different from many other types of companies. While other businesses generally prefer to retain as much of their earnings as possible to fuel growth and build up their balance sheets, banks, generally speaking, would rather pay out as big of a portion of their earnings as they responsibly can. This follows from the fact that investors rank bank stocks by return on equity, which is calculated by dividing a bank's annualized net income by its shareholders' equity. Because equity includes both retained earnings and capital that's been paid into the company by the issuance of stock, retaining earnings as opposed to paying them out necessarily lowers a bank's ROE. But banks aren't free to simply pay out as much as they would like. With respect to big banks in particular -- those with more than $50 billion in assets -- they have to get approval from the Federal Reserve each year in order to raise their dividends. This is part of the stress test process. Or, more specifically, it's part of the Fed's Comprehensive Capital Analysis and Review. This process seeks to determine whether so-called systematically important financial institutions have enough capital to weather a downturn in the credit markets akin to the financial crisis of 2008-09. Banks that have enough capital, and are projected to maintain a sufficient amount of capital under a hypothetical severe economic downturn, are given the green light to raise their quarterly distributions. But banks that don't have as big of a cushion, or if the Fed determines that their capital planning process is somehow deficient, are forced to wait until the next year to resubmit their proposal. In Bank of America's case, it's only been given the go-ahead to raise its dividend once (in 2014) since the crisis. In 2011, it requested an increase but was denied. And while it was given permission to buy back more stock in this year's test, it withdrew its request to raise its dividend after discovering an error in its capital planning process. Analysts and commentators assume that these missteps are what led to the resignation of Chief Financial Officer Bruce Thompson shortly after Bank of America reported its second-quarter results in the middle of July. The net result is that Bank of America and all of the other major lenders in the United States are on the same timeline when it comes to dividend hikes. For the foreseeable future, every big bank that wants to raise its quarterly distribution can't do so until the Fed issues the results of its annual stress test -- which, at least for the last few years, has always come in the middle of March.